Now we come to it. Isn’t this where we expected to be at this point of the postseason when everyone was making prognostications and predictions in August? It’s funny that, after all the narrative tributaries this season had, all the tangential contenders that seemed to pose a threat to the projected status quo in the NFL, we’ve come down to what were considered the four best teams in the beginning of the season as the final four standing. In the AFC, the two best teams, with the two best quarterbacks in the league (and perhaps the two greatest of all time), are meeting in Denver on Sunday to decide who gets to travel to East Rutherford for a chance at another ring. Let’s take a step back for a second and appreciate the era of football we’re experiencing at the moment, and the fact that it could very well be over within the next 2 to 3 years. Isn’t this the matchup every neutral football fan would want to watch? The stakes have never been higher. Let’s get to it. In many ways, this game could come down to who can overcome their significant injuries more effectively. Both teams have been devastated by the injury bug, losing valuable components of their roster. New England’s struggles are well documented – they lost Vince Wilfork, one of the top DTs in football, early in the year (and his backup in Tommy Kelly), Jerod Mayo, their rock-solid Pro Bowl MLB, and Rob Gronkowski, the best TE in the league when he’s on the field. Denver has lost Ryan Clady, their best offensive lineman, Von Miller, their premiere pass rusher, and now Chris Harris, the player who logged the most defensive snaps for them this season and was their best and most consistent cover corner. All of these injuries will be impactful on the game and insure that what we saw in November, while valuable in providing information on prior matchups, will likely be different than what we see this Sunday. The Patriots over the past three games have averaged 214.3 yards per contest on the ground. With the rushing game operating at such a ridiculous clip, the passing attack has taken a back seat – but don’t think for one second that Tom Brady won’t be a factor in this title bout. With the Broncos’ already vulnerable secondary now missing Chris Harris, expect Brady to take advantage of certain matchups, specifically whoever Quentin Jammer (who struggled against rookie WR Keenan Allen in Denver’s divisional win, giving up over 100 yards and 2 touchdowns in the fourth quarter) or Champ Bailey is covering. With dynamic rookie wide receiver Kenbrell Thompkins and fellow rookie deep threat Aaron Dobson potentially in the mix at receiving corps, Brady could have as good an arsenal as he could hope for going into this game, an arsenal dangerous enough to take advantage of the 27th-ranked pass defense in the NFL. If Belichick watched the Chargers-Broncos game, and I imagine he did, he will have seen that the Chargers’ run game was stifled from the get-go. Despite this, the Chargers were adamant on running the ball until they were down 17-0 in the 4th quarter and forced to let Rivers sling it. Don’t expect Belichick to make the same mistake. The Broncos defense will already be on its toes trying to stop the New England running attack by virtue of the Patriots’ massive recent success on the ground, so Patriots OC Josh McDaniels could very well open the game with some play action passes and screens to take advantage of an over-pursuing front-seven or secondary. The Patriots would, in effect, be setting up their potent run game with the pass, which itself was already set up by the Patriots’ displayed running prowess in their three previous games. 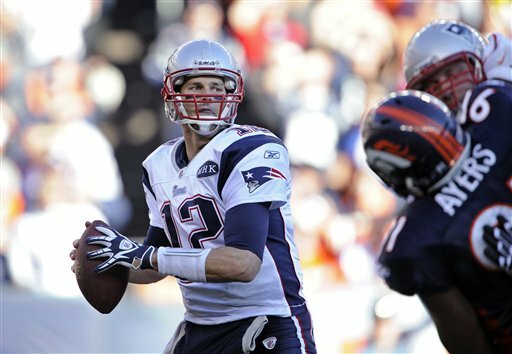 What kind of success will Tom Brady have against a banged-up Denver D? The Broncos’ offense has been, of course, legendarily potent. Peyton Manning’s production through the air was something this league has not seen in its 94-year history. Still, the past 9 games has seen Denver’s scoring average dip from 43.9 PPG during the first half of the season to 31.9 PPG. 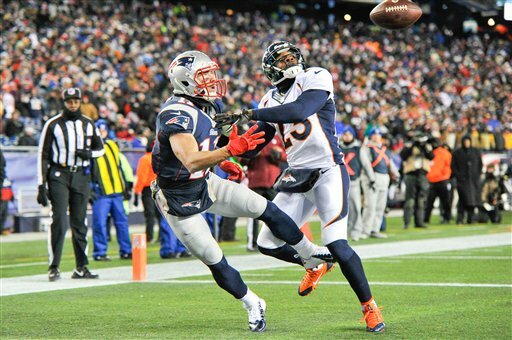 Since Week 9, the Patriots have actually outscored the Broncos 308-287, averaging 34.2 PPG. The last time the Broncos and Patriots played, the Patriots gave up 280 yards on the ground, over 220 of which belonged to Knowshon Moreno. This, however, came at some expense to the passing game. Manning, throughout the contest, noticed that the Patriots were constantly in nickel and dime packages, devoting multiple personnel to defending the pass while leaving the box vulnerable to interior rushes. He took advantage of that often, and subsequently, only passed for just over 150 yards in the game. While the running game was extremely effective, it did ensure that the Broncos did not beat the Patriots on the deep play, something that was an integral part of their coming back in the second half from a 24-point deficit to eventually win the game in overtime. With Patriots ILB Brandon Spikes on IR and ultra-athletic rookie Jamie Collins essentially replacing him in the starting lineup for the foreseeable future, the Patriots will have a slightly better chance at defending the run should they approach Manning with the same tactics. In the November matchup, the Patriots were forced to remove much of their linebacking corps to focus on the pass, since pass coverage was not a strength of their starting line. That changes with Collins, who recently displayed his ability to cover, rush the passer, and stifle the running game (6 tackles, 1 INT, 1 sack, 2 tackles for losses against IND). The Patriots should be able to rotate personnel around Collins while leaving him in as a defensive X-factor in the middle of the field. The Broncos, though, have no shortage of weapons, and I believe the true deciding factor in this game comes down to whether or not the Patriots’ talented secondary can repeat their success of holding Demaryius Thomas, Eric Decker, and Wes Welker to limited production (the three combined for just 9 receptions for 77 yards in the Novermber game). The Patriots will also be tasked with shutting down Pro Bowl TE Julius Thomas, a burden they might give to Jamie Collins considering his comparable size and speed. The Patriots boast one of the best corners in the league in Aqib Talib, the best rookie corner in the NFL in Logan Ryan (who ranked second to Richard Sherman in defensive passer rating and led the Patriots with 5 INT), and the talented and explosive Alfonzo Dennard, who picked off Andrew Luck twice in the Patriots 43-22 win over the Colts. If the Patriots can get decent man-to-man coverage on Denver’s receivers, and get a good run-stopping performance out of 6-2, 350-pound Sealver Siliga, their chances in this game increase dramatically. If not, it’ll be tough to win, and Tom Brady will need to have one of the best games of his career to best the Broncos in Denver. On that note, historically, Brady has performed very well against this John Fox/Jack Del Rio Denver defense, averaging 313 yards passing, 3 touchdowns per game, with an astounding 120.4 passer rating in those games (also going 4-0 in that slate). This is the hardest game to call of them all. The matchup in November likely would have end in a tie had it not been for a special teams screw-up, and it’s easy to see this one also going into overtime. These two quarterbacks are masters of their crafts, and have shown versatility in excelling in different styles of offense, as well as adapting to both the shortcomings of their surrounding personnel and the defensive schemes they’re confronted with – but this game isn’t just about the signal callers. Football is the ultimate team game, and who is or isn’t out on the field other than the quarterbacks will make all the difference. For me, the loss of Chris Harris is absolutely the most significant injury and will affect how the Patriots can choose to move down the field. With Aaron Dobson and Kenbrell Thompkins returning to the lineup, the Patriots will have speed on the outside to necessitate safety attention, and open up the middle of the field to Edelman, Amendola and Vereen, and whoever is matched up on Harris’ replacement. The potential for a big passing day by the Patriots combined with their recent track record of running the ball well makes it difficult for me to pick against the them, even going up against Peyton Manning. Still, you can’t discount the highest-scoring offense in NFL history – that’s why I full expect this game to go over 70 points combined, and in shootouts between two Hall of Fame quarterbacks, the last one to have the ball is usually the one to win. Since two #1 seeds getting to the Super Bowl is historically speaking unlikely (in the 23 seasons since the introduction of the current 6-team playoff system, it has happened only twice), I’ll go with the Belichick-led team in this one.